A.J. 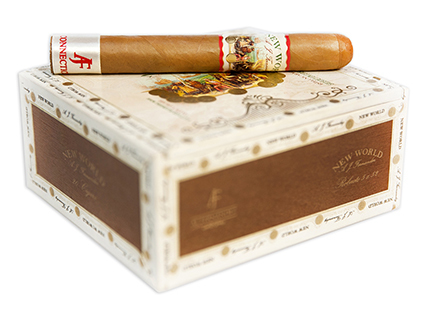 Fernandez and his father Ismael teamed up again in 2015 to create the New World Connecticut cigar ~ a line extension to their very successful release of the highly ranked New World line introduced in 2014. Featuring a stunning Connecticut shade wrapper grown in the US, the New World Connecticut is blended with filler tobaccos from Nicaragua and Brazil bound in leaf from San Andrés, Mexico. Mild to medium in strength and full-flavored, the New World Connecticut delivers refined and delicious notes of sweet cedar, nuts, rich cream, toast, and hints of black pepper. Hand-rolled at Tabacalera Fernandez in Estelí, Nicaragua, these premium cigars are nicely priced and pair wonderfully with a morning cup of coffee. The New World Connecticut cigar earned 88 points and a "Best Buys of 2016" award from Cigar Aficionado.